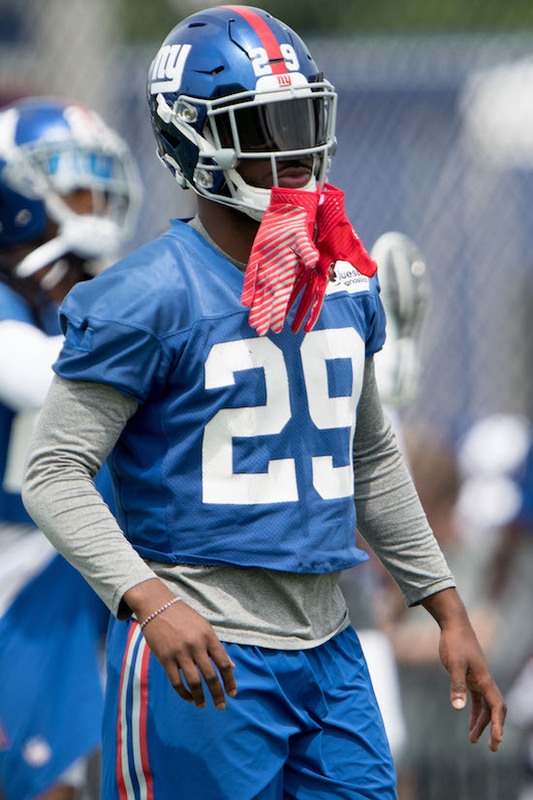 The New York Giants held their seventh summer training camp practice on Friday at Quest Diagnostics Training Center in East Rutherford, New Jersey. Wide receiver Sterling Shepard (ankle), wide receiver Tavarres King (ankle), and linebacker Keenan Robinson (concussion protocol) did not practice. “(Shepard’s MRI showed) nothing serious, nothing new,” said Head Coach Ben McAdoo. Not much to give you guys today, it was a walk-through in every sense of the term. No actual hitting. No actual throwing the ball. Routes were run at 20% speed max. Sounds like tomorrow they are gonna get after it a bit. I will be there for it. 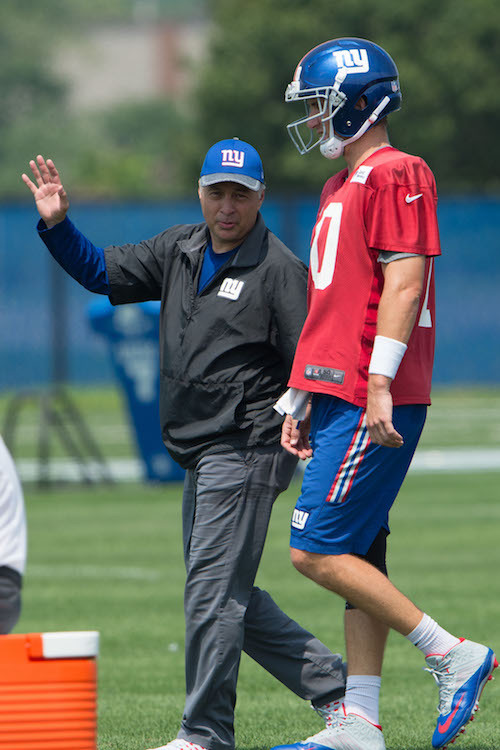 The guys that I have down as “Out” for today’s practice but still involved, were QB Eli Manning, WR Brandon Marshall, CB Dominique Rodgers-Cromartie, DT Damon Harrison, and LB Jonathan Casillas. Good to see DE Devin Taylor and RB Shane Vereen out there with the team, hope they are in live action tomorrow. I did not see WR Tavarres King out there, so I guess his ankle roll needed a day of treatment. A name we haven’t talked about yet is fourth year veteran OG/OC Jon Halapio. Originally drafted by the Patriots in 2014 (6th round) from Florida. He has since bounced around the league a bit but has been with NYG for almost a full year now. He’s never played in a regular-season game but with the instability inside when it comes to depth, I think he has as much of a shot as any of the other interior guys to make this team. The versatility is a plus and he has had some solid 1-on-1 interactions this week. OT Chad Wheeler saw time at his usual LT spot in addition to sometime at RT and RG. I’ll say I have been pleasantly surprised by his is presence this week. We already knew he was a plus athlete but I still think he is a year away from being a factor. He needs work in the weight room. QB Davis Webb got more reps today with Eli being on the sideline. Even though the speed of it was so low, it was an important day for him no doubt. A lot of work on hand signals with his receivers and proper footwork on both passing and running plays. Casual fans will overlook the importance of that, but it is vital for his progression. For what it’s worth, he appeared to do everything right. Another check mark for him. When it comes to the fullbacks, my guess based on their team drills is Shane Smith is at the top of depth chart. OG D.J. Fluker was probably the hardest worker on the offense today, making strong efforts on his pad level, lateral footwork, hand placement…etc. He got a few looks at backup RT today. LB B.J. Goodson on the field again today. So involved with other players and coaches during his rest time. And he was the lone defender who appeared to be going a little closer to full speed than the other guys. Not surprised. NYG has a lot of DL talent and they are very versatile. We may see them get 3 DTs on the field more often than we’ve seen in the past. Damon Harrison can play a 3-4 NT-type role and the Jay Bromley/Dalvin Tomlinson/Robert Thomas trio…two of them can be on the field at once I think. This gives NYG several options with what to do on the outside. The more looks, the better. DE Kerry Wynn is still in the team’s good graces it seems. He’s been here awhile now and the team knows what they are getting out of him. A kid that knows the game well, plays hard, and can bring it in different situations in different roles. Devin Taylor and Owa Odigihizuwa are going to have really perform well if they want to leapfrog him. That’s all folks, sorry it wasn’t too eventful today but as I said, no such thing as unimportant day. I should be back tomorrow. Friday’s practice was very light, with helmets but no pads and more of a walk-thru. 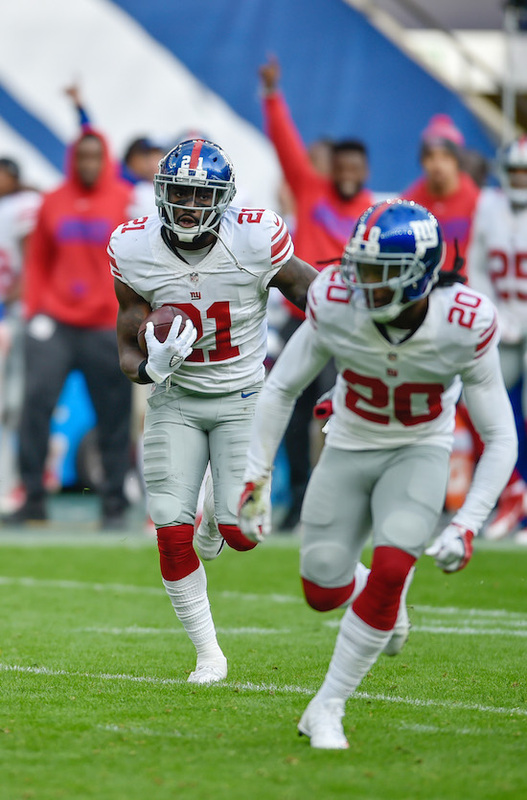 Veterans given the day off included quarterback Eli Manning, wide receiver Brandon Marshall, defensive tackle Damon Harrison, linebacker Jonathan Casillas, cornerback Janoris Jenkins, and cornerback Dominique Rodgers-Cromartie. 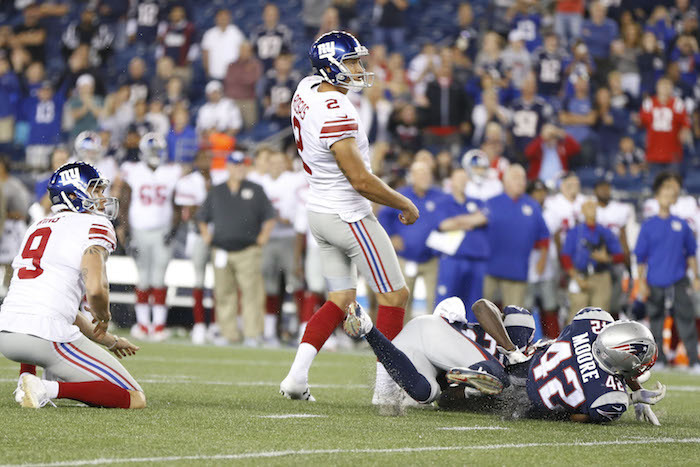 Giants ran a fake field goal where punter Brad Wing threw a touchdown pass to offensive lineman Justin Pugh. Place kicker Mike Nugent went 4-for-4 on field goal attempts. The eighth training camp practice will be held on Saturday, starting at 10:55AM. This practice is NOT open to the public. The training camp schedule is available at Giants.com. 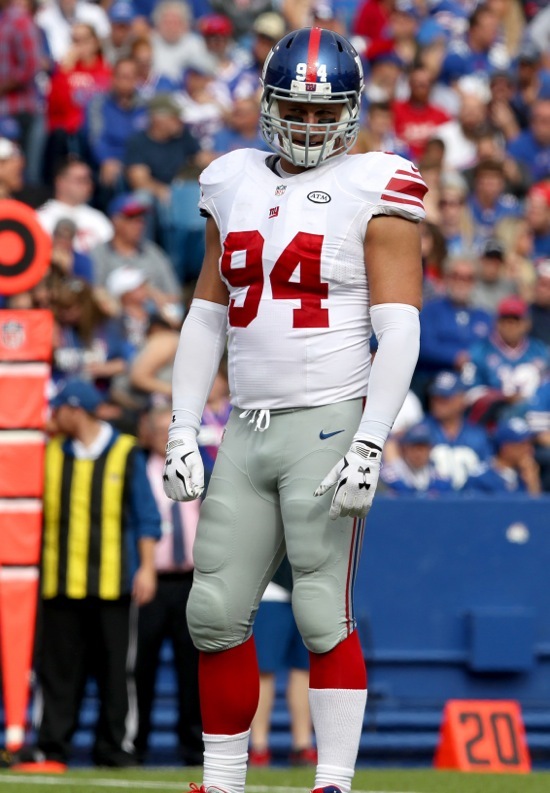 Left guard Justin Pugh (knee), safety Nat Berhe (concussion), linebacker Mark Herzlich (concussion), and defensive end Owa Odighizuwa (knee) have officially been ruled out of Sunday’s game against the Pittsburgh Steelers. Offensive lineman Brett Jones (calf) and offensive lineman Marshall Newhouse (knee) are “questionable” for the game. Wide receiver/returner Dwayne Harris (wrist) is “probable” for the game. There is no press availability to the team on Saturday. The Giants play the Steelers in Pittsburgh on Sunday at 4:25PM ET. 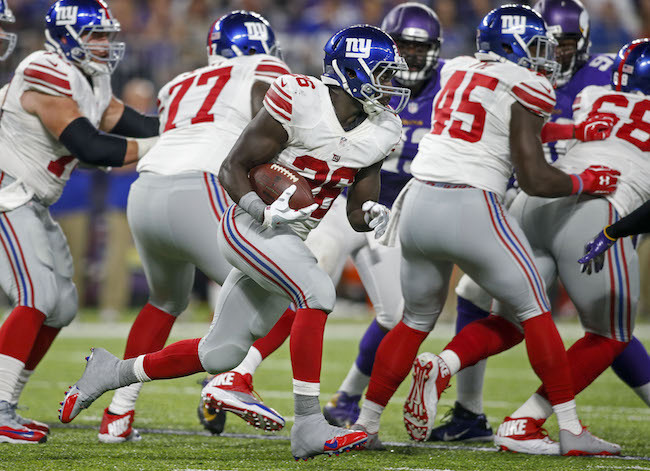 The New York Giants have placed running back Orleans Darkwa on Injured Reserve with a lower leg injury. The team filled his roster spot by signing safety/linebacker Eric Pinkins from the Practice Squad. 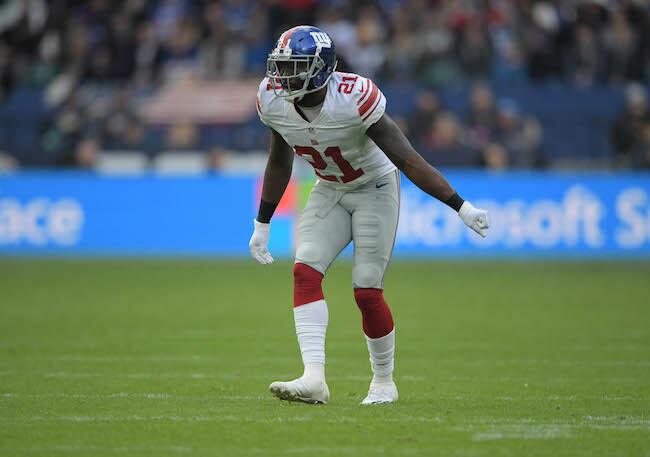 Darkwa played in 10 games with two starts for the Giants in 2016. He carries the ball 30 times for 111 yards (3.7 yards per carry) and two touchdowns. He also caught two passes for 12 yards. Darkwa was originally signed by the Miami Dolphins as a rookie free agent after the 2014 NFL Draft. He played in four games in September before being waived in October and signed to the team’s Practice Squad. The Giants signed him off of Miami’s Practice Squad in November 2014. Pinkins was signed to the Practice Squad in October 2016. Pinkins was originally drafted in the 6th round of the 2014 NFL Draft by the Seattle Seahawks, who moved him to linebacker. Pinkins was waived by the Seahawks in September 2016. He has played in six regular-season NFL games with no starts. Pinkins has a nice combination of size and speed, but his instincts have been questioned. The players return to practice on Wednesday in preparation for Sunday’s away game against the Pittsburgh Steelers.